Because of the high alcohol content, it is not uncommon for alcoholics to consume large quantities when regular alcoholic beverages are difficult to find. This is dangerous due to the inclusion of other chemicals, such as hydrogen peroxide, methanol and eucalyptus oil. As well, the alcohol itself may cause mouth cancer. As such, excessive mouthwash consumption is a serious issue. About 10 to 15% of alcoholics who undergo detoxification in hospital have consumed non-beverage alcohol such as mouthwash. This number is quite concerning since it reveals how many people are putting themselves at risk of injury, illness or death simply to get their next alcohol fix. Since these types of mouthwash contain alcohol, there is a risk that they can cause a relapse in recovering alcoholics. Even the taste of alcohol while using mouthwash on a daily basis or a glimpse of the alcohol content displayed on the bottle is a cause of concern for those in recovery. As such, these products should be kept out of reach of alcoholics struggling to break free from addiction. Fortunately, this is simple to do as there are several non-alcoholic versions of mouthwash which still provide the same oral hygiene benefits. By switching brands, it is possible to limit temptation without losing out on any positive health effects. As for why an individual would choose to consume mouthwash instead of beverage alcohol, this comes down to a few simple facts. Firstly, it is much easier to conceal excessive mouthwash use from family members and friends. A simple trip to the bathroom can provide a convenient way to get that next hit without anyone else knowing. The minty breath smell that often accompanies mouthwash use simply adds to the ease of concealment. Restrictions which may apply to beverage alcohol, such as beer or spirits, may not apply to products such as mouthwash, since they are not made for human consumption. This means that an intoxicated individual may still obtain a bottle or two even though they may be turned away from purchasing beer, wine or vodka. Mouthwash is available almost any hour of the day. This is unlike more conventional forms of alcohol which may only be purchased at certain times from specific dealers (depending on the country). If the need arises when the regular liquor stores are closed, alcoholics can simply head to their local convenience store or supermarket and purchase a number of bottles of mouthwash instead. The price of mouthwash at these types of stores is also much cheaper than the typical cost of beverage alcohol. Despite the ease of access and concealment, drinking excessive amounts of mouthwash can still be very dangerous. Worst case scenarios for this type of activity include multiple organ failure and even death. * If an individual has a minty smell to their breath all day long, it may mean that they are consuming mouthwash on a regular basis. By itself though, this is not enough to prove that an individual is partaking in this dangerous activity and other proof must be found before confronting them about it. * Keep a look out for large number of empty mouthwash bottles which have been thrown away. While many alcoholics will go to great lengths to hide their addiction, sometimes they may get sloppy, especially after they have consumed a great deal. 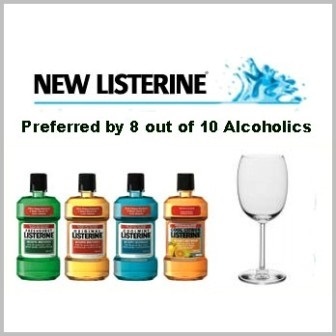 * If there is any doubt, purchase some non-alcoholic mouthwash instead and see if any complaints are raised. This type of mouthwash has been shown to be safer anyway while still providing the same oral hygiene benefits.